Electronic Safety and Licensing Application is Now Live! 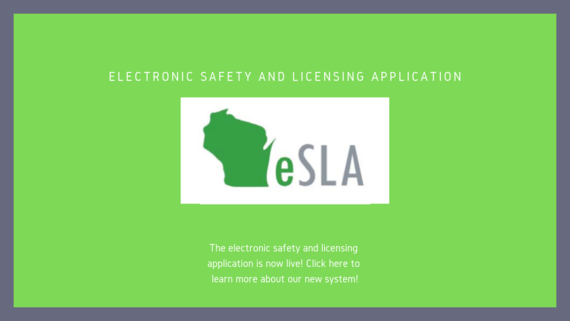 The Department of Safety and Professional Services would like to welcome you to our new online customer portal eSLA – Electronic Safety Licensing Application https://esla.wi.gov. The eSLA portal will allow you to complete all transactions related to your credential or plan review, including renewing credentials, and making all payments online. Navigate to https://esla.wi.gov and choose “Existing DSPS Customer” under the “New Users” heading. Then choose “Obtain Security Code” You will be prompted to enter either your SSN or email address. If you enter your SSN, you will need to enter a valid email address so you can receive your security code. A security code will be sent to your email address. Complete the fields in the prior page. Both your email address and SSN will be necessary to complete linking your account. Please contact the department at (608)266-2112 regarding any questions related to the new eSLA portal registration process. CONFIDENTIALITY NOTICE: This message contains information which may be confidential. This information is only for the use of the individual or entity to which it was intended. If you are not the intended recipient, any usage or action taken in reliance upon the contents of the information contained in this message is strictly prohibited. If you have received this message in error, please immediately delete the email. Thank you.